The following relates only to your Therapy Marketing Institute membership information. The information below is in no way tied to the billing information we have on file for your account. If you need to update your billing information, please contact our support team. 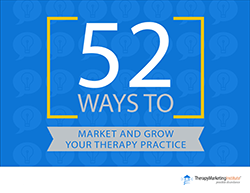 Subscribe today to receive weekly updates on some of the best private practice and therapy marketing tools and techniques we've learned from helping hundreds of therapists just like you. © Copyright 2013-18 Therapy Marketing Institute - All rights reserved.